Finally! A project I have started AND finished! Our friends have just had their first baby - a gorgeous little girl. Today I got to have squishy newborn cuddles with her! I wanted to make her a gift, instead of buying one like I typically do. I have a special embroidery that was done for me by a lady in our church (our organist, Mrs Brooks, for those who know her!) when I was born. It was up on the wall in my room when I was growing up, and it only came down when I moved out to get married! Somehow it never made it back on to my wall, but I'm determined to rehang it now... Here it is. Anyway, so I thought I'd like to do a name embroidery for this beautiful girl. I did some Googling for inspiration. Really liked this one and ended up going mostly from this one and this one. I love the bunting, not so keen on the embroidery. Doesn't matter I suppose, I hope she likes it - and that her Mum's not ashamed to hang it up somewhere! ...living in a toy-strewn house. But we're playing nicely! ...enjoying seeing my genetics coming out in my children. Curly-haired girls! ...making lotsa sandwiches. Every day. ...teaching the children how to breastfeed... Well, this one's learning by observing Mummy. FYI, I do not feed Tristan from my tummy button, as it appears my children think. ...enjoying our time playing outside. This day I was in stitches laughing at Elliot's expressions as he threw the ball in the air and attempted to catch it. Hilarious! ...crafting! Lately I feel like I've been so busy trying to keep our household functioning that I haven't had the time to put my craft hat on. But one morning last week, I was finished my devotion time and the kids still weren't awake, so I thought, "Quick, grab something out and start cutting!" So I did. 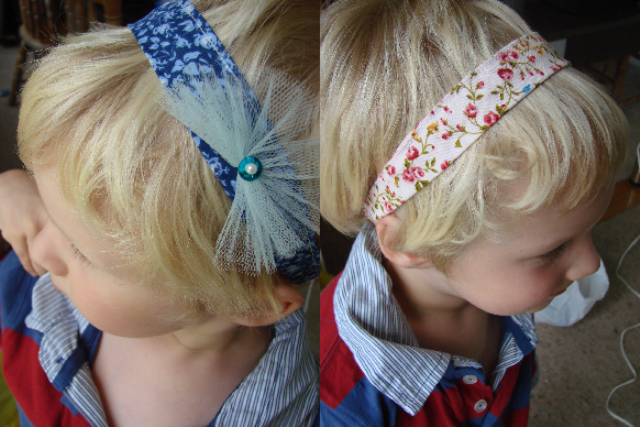 Also, here are two headbands that I made for a present for Elliot and Rosie's little friend's 4th birthday. And yes, thank you to Elliot for being a superb model, my cool dude. He's awesome. ...attempting to start solids. Tristan isn't having a bar of it. I like to take my Wardrobe Wednesday photos outside because our house has no blank walls or beautiful, light-filled spaces to work with. But it's raining today. (Well, it wasn't this morning, but now that both the younger kids are in bed and Elliot's at kindy and I have a chance to take some photos the rain has come to the party too.) I've attempted to compromise by using the covered deck! Yes, THOSE shoes! Told you they were my new favourite! Pants: From TradeMe - they were included in an enormous bag (and I mean enormous!) of stuff that cost me only the price of postage! Well, I have yet to attempt to sew anything for myself to wear (I've made a few things for the kids! ), but I'm heading more and more towards that goal. I need to stoke up some courage first, me thinks! So here is the handmade part of my outfit. I bought the beads and the wire (tiger tail, 'tis called) and beaded my little heart out. This is still one of my favourite necklaces. It is similar to the one I wore on our wedding day - which I also made. Wanna see that one too? Hmm, it's hard to see in this picture. It has three strings too, but they are spaced out and each bead is separate. 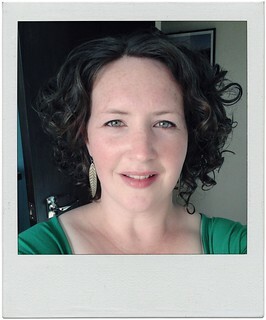 And yes, I know, I look totally different now than I did on that day. Someone's even said, when looking at our wedding photos, that they didn't recognise me. But hey, I didn't have three gorgeous children then. And they make it all worth it. Trying to capture a shot of my necklace, making a ridiculous face and capturing that instead. It's a million laughs a minute 'round here! Why don't you head over and peruse the other entries too? Yes, it's nearly Saturday. But still, by popular request (he he, thanks Zani!) here is my entry for Wardrobe Wednesday! I only realised how similar my outfit this week is to the one from this week, but it's differences are they key! February's Love to Love You theme is really met this week in my jewellery. Every single piece of jewellery I am wearing was a gift from someone I love and who loves me. My diamond pendant is from my fabulous husband for my 21st birthday. The chain it hangs on is from my Mum - not the original chain, because it broke. :( My earrings are hand-me-down of a sort from my Mum, who was given them by her only brother, my uncle. My heart padlock chain/bracelet (glimpsed in the photos above) was also from my Mum for my 21st birthday. Hmmm, my Mum's given me a lot of jewellery... Lucky me! And now for the funny part! This week I'm heavy on the outtakes. I look ridiculous but I had to share them because they made me laugh! This one is what happens when you set the timer and then spot a wasp on your chair but your brain says "strike a pose" as the timer goes off! Wednesday evening I decided to grab some photos just as the sun was about to set, and I ended up wasting a whole bunch of time trying to get a jumping or leaping photo. Ha ha, what a lark! Happy Wardrobe Wednesday (on a Friday) everyone!